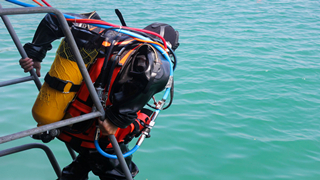 Type A – hose diving equipment with rigid-shell helmet and boots equipped with breathing equipment, operating on open or ventilated respiratory circuit. Type B – autonomous diving equipment with full face mask or half-mask for swimming with flippers and with breathing apparatus, operating on open or semi-closed (closed) respiratory circuit. Team is to overcome the obstacles in water. The participant is to dive and swim for 20 meters under water, swim for 30 meters free-style, and start conducting the next element. Between the pontoons fixed rotating "drum". A participant swims to him, overcomes the "drum" from the top in any way, then swims a distance of 30 metres in free style and moves on to the next element. At a depth of 3-4 meters there is a "dummy" of the drowned man. A participant swims to the buoy (sign), dives and picks it up from the bottom and transports it to the pontoon (the starting place) at the distance of 10 meters. The finish is upon the rise of the "dummy". Number of competitors – 6 with an opportunity to change 1 competitor. Camouflage uniform and neoprene boots. Armament – dummy of AKS-74 assault rifle, magazine pocket with 2 magazines for each competitor. The start and finish are located not closer than 3 metres from the first and last obstacles respectively. Start is simultaneous. Finish – by the last competitor. Penalty points are awarded for a failure to help the participants to each other (with the obvious necessary) in overcoming obstacles, loss of items of uniforms, equipment and weapons. Belayer diver is ready on the diving post. Enclosure rescue equipment is located 3 meters away from the start. A diver opens the cubicle with a special key, connects the hose to the fitting of ventilation air in the correct sequence to open the purge valves. The torpedo-tube is located 3 meters away from the start. It is necessary to open the lid of hatch, pawn a deep-water pencil-case inward, to close the lid of torpedo-tube, produce a signal buoy. Exercise is considered executed after arrival of diver to the place of start, emerging of buoyancy from the cubicle and wedging out signal buoy of rescue hatch according to the produced requirements. It is necessary to perform the work of cutting a predetermined length of the metal corner using a single electrode. The exercise is considered to be accomplished when the referees buoy appears on the surface. The diver performs the circle welding of 2 pipes made of 10 mm sheet steel type of low alloy structure for welded constructions in flat position with further sealability testing of the weld. A passage of closed compartment is obstructed. It is necessary to deblock the entrance. It is necessary to saw the deck in 4 segments of indicated length that are to be used during the passage through the compartment. Using a collar, a rub strip under a collar is laid on the hole of pipeline by a collar and tightens him the keys with the purpose of subsequent serve of air on a highway. Using the 8 screws and 2 layings it is necessary to make two flange connections in the pipeline for further air delivery to the air cushion with the injured person. It is necessary to perform work on the installation of the patch on the hole in the line for subsequent purge line. The passage to the air cushion is narrow. Using hydraulic instrument it is necessary to organize works to expand the passage and fix the construction using parts of the deck. Open the air supply valve to the surface to control the quality of the seal of the holes, and then return through the layout to the finish. Exercise is considered to be performed when air passes through the pipeline and tightness of all the nodes of the layout. Participant must assemble two flange connections with studs of different diameter, nut screws and gaskets. When assembling the left connection, the participant will need 6 studs, diameter M10, 12 screws of the same diameter and gasket with a suitable number of holes. When assembling the right connections, participant will need 8 studs, diameter M8, 16 screw nuts of the same diameter and gasket with a suitable number of holes. The participant is to assemble two threaded connections. Threads of different diameters are applied to pipes of the same cross section. It is necessary to assemble the connection with the help of a lever inserted into through holes, perpendicular to the axes of the section of pipes, and used as a wrench. The participant is to assemble three threaded connections and install a plug. The first bolt (M16 / 50) is installed from the end of the flange with 6 fasteners (right), then the left lower bolt (M12 / 35) and the upper left bolt M8 / 40 are installed. The M8 / 40 bolt must be screwed into the pipe flush so that the plug fits snugly into place. When installing the M16 / 50 bolt, it is necessary to use a knife with a truncated end, since the bolt head has a "flat" groove. After the completing the assembly of the product, the working diver takes it to the surface to check the correctness of the work of the referee team, then the product descends to the place of assembly (disassembly), the second diver performs his complete disassembly. Cut-off time – from the command "START" to the command "STOP" to check the product for the correct assembly of the referee team and crossing the second diver of the finish line after a complete disassembly of the product. Accrual of penalty points is made by adding penalty seconds for violations (errors). A driver with 20-meter rope passes through the control points marked by buoys on the bottom and finds a diver in emergency. The diver has to cut the rope twice: before and after the tangled diver, tie both ends with a square knot, and bring the diver to the emergency stairwell. A victim is extracted ashore without vital sparks. It is necessary to conduct reanimation actions. The victim comes in consciousness, and the signs of damage of bones of pelvis appear for him. The goal is to provide proper resuscitation and transport the drowned to the ambulance at 100 m distance. In case of violation of exercise rules and safety regulations the divers are warned, fined and disqualified for a period from one day till total disqualification. If two or more divers of the same team are disqualified the entire team is disqualified from further participation in the contest. The winners are determined by the maximum amount of points by typing in the three stages of the contest. It the situation with the equal amount of points from one or more teams, the advantage has the team with the best score in the second stage – the Contest for the implementation of underwater technical works. Awarding of the winners of the contest is carried out: 1. In the individual championship – medals for first, second and third place. 2. In the team event – the cup for the first place of the Contest.